Merry Christmas Trina...and many, many more blessings to you, Mike and to your sweet babies in the New Year!!!! and the very same to you ! I can only imagine the joyful Christmas you will be celebrating this year with those glorious children. Enjoy making memories and special traditions in your county farmhouse. Blessings to you and your home. I always enjoy pictures of your house at Christmas. Your Grandmother's dishes are some of my favorites too. And thanks for the pomegranate link... can't wait to try that one... IN MY SINK! LOL Hope you and your family have a wonderful Christmas! Merry Christmas, Trina, Mike, Graham and Margaret! Merry christmas and happy new year from ISTANBUL..
And to you as well. Stunning photo as usual...yes, I want the sheep too! It must have been so exciting this year!! Merry Christmas and Happy New Year. Absolutely stunning - as always! Merry Christmas to you and yours!! Merry Christmas, Trina! Your home looks so beautiful, as always. Merry Christmas to you and Mike and thse sweet babies. I know you made many memories!!!! Merry Christmas, Trina! I know it was so wonderful with those sweet babies! And wishing you and yours a season of magical holiday joys and memories. Merry Christmas! I love your blog. Hope your holidays were filled with warmth and joy! I am your new follower, I found your blog from one of my Etsy customers. I sell vintage finds and handmade burlap items. You have lots of great stuff here! Happy Holidays to you and your beautiful family. and to you, a little late admittedly! Hope you and your family had a great Christmas. 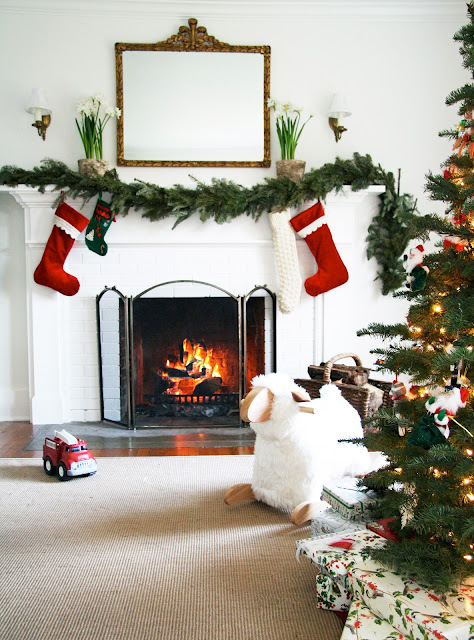 Those stockings are so cute on the mantel! Trina, Your gram's red dishes look so pretty on the shelves with the pomegranets! Happy New Year to your beautiful family!